You are here: Home / Candy / Best Fudge Ever! I’m sorry. I really am. Most of us are making resolutions to be healthier (myself included), and here I am posting a recipe that includes 5 cups of sugar. Please don’t hate me. I will say, though, this is a recipe I need to share with y’all. This is the fudge that my Mom makes every holiday season. My Memaw makes a very similar version as well, except she swears by marshmallow cream instead of marshmallows. Mix cocoa and sugar in a dutch oven. Add both milks and mix. Bring the mixture to a boil (to where the mixture almost bubbles over). Lower the heat and stir the mixture. Remove the mixture from the heat and working quickly, stir in the butter, peanut butter and marshmallows. Pour the batter in a parchment paper lined 9×13 inch pan. Allow it to cool for 2-3 hours. Cut and enjoy! I love making fudge, but haven’t found a chocolate and peanut butter one to try yet. I’m definitely going to try this one out! Holy cow this looks fabulous! I think I need to make this now (which is not helpful for the pre-wedding losing weight plan), but it just looks so good! 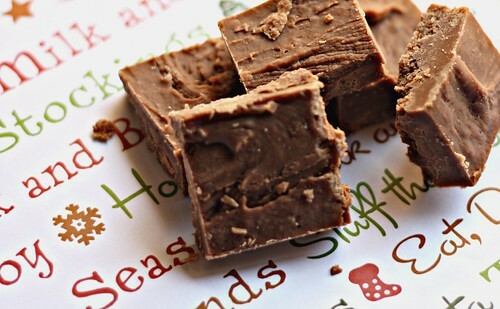 This fudge looks fantastic! I don’t see the marshmallows though. Do they melt into the mix?